Designed as an exhibition piece in 2011, Escape routes and it’s counter piece Meeting Points offer an artistic interpretation of paths of movement through an unnamed city. The reason for escaping is not made clear so the maps are esoteric and unexplained in terms of a clear purpose yet cartographically they create an interesting aesthetic. 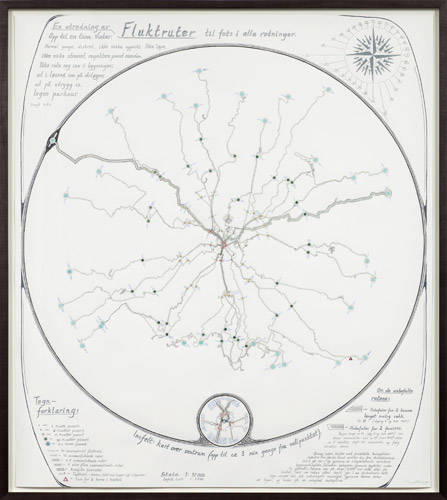 The first map, Escape Routes, plots the paths of 32 directions around a compass rose from the centre of the city showing the different characteristics of the escape route through symbology. The paths are defined as: Up to an hour. Wintertime. Moving discreet, not getting noticed, not running, staying cool. No trespassing. Keeping outdoors, avoiding ski tracks, deep snow, thin ice. No parkour. Avoid trouble. Again, these are somewhat obscure but point to the way in which the paths have been classified. Two are picked out for special attention – the first that shows the farthest you can reach in an hour; the second the path most likely to put off anyone pursuing. The detail in the symbology of lines created with dots and other small geometric marks shows clear differentiation in type. The second map, Meeting Points, shows through increasingly sized circles the various places that one could meet at different times along the one hour journey. Each circle acts as a lens through which the otherwise obscured street network is displayed. This effect guides the eye to only those parts of a complex street network relevant to the theme. It focuses attention and declutters the otherwise noisy image. 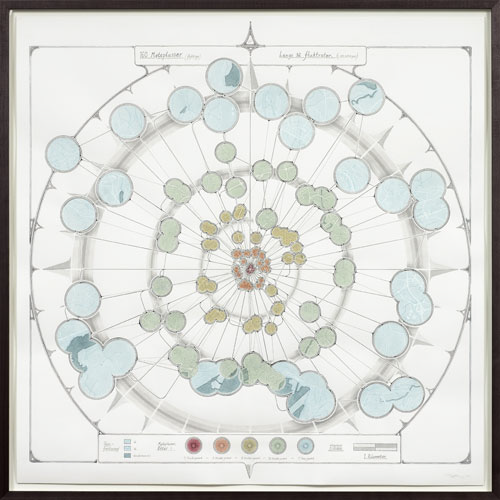 An artistic interpretation of map form and function that creates an interesting aesthetic with practical cues which more purposeful cartography might borrow. More images (but not much more detail) on the artists web site here. This entry was posted in MapCarte and tagged abstract, MapCarte, painted by @kennethfield. Bookmark the permalink.